Oxford University in England offers an extensive set of summer programs. We are part of Week 4 (of 5) of THE OXFORD EXPERIENCE offered at Christ Church College, one of the 39 separate colleges which make up the University. Christ Church College was founded in 1525 by Cardinal Wolsey and re-founded (after Wolsey’s fall from grace) by King Henry VIII in 1546. Henry, his daughter Queen Elizabeth I, and other great figures from English and Oxford history stare down at us as we eat. There is of course a pervading sense of tradition, and the food was great as well. By the middle of the week, sometimes we just came in and sat down, paying no mind to the surroundings. But one glance up and it came back in a flash. We felt privileged to be there, eating at the same table where Queen Elizabeth (both Queen Elizbeths) had eaten before. We arrived on Sunday, and every part of the arrival experience was superb. The course packets were ready, a young man carried our luggage to the dorm, and our en-suite room for two was actually larger and more comfortable than we anticipated. The primary purpose, of course, was the fantastic academic experience we had, Pat’s course on ETHICS and mine on BEETHOVEN. We’ll describe our class experiences in a separate post. For this post, however, I’ll try to present a sampling of our week’s experience outside of class. 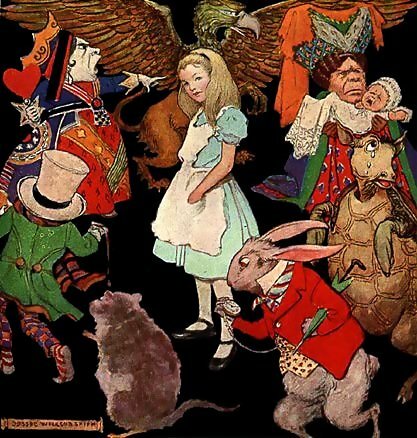 Lewis Carroll was the pen name of Charles Dodgson, a mathematics tutor (professor) at Christ College from 1855 to 1898. Alice was the daughter of the Dean of Christ Church, and Dodgson took to making up stories to entertain Alice and her sisters, often basing his characters and settings on local people and places. Our walking tour of Christ Church College was given by a delightful and engaging person whose name I am embarrassed to say I did not write down and don’t remember (HELP-if you know the name, please let me know). The tour included many Alice places, including the great tree and the Alice gate through which the real Alice apparently peered through into what really was a forbidden garden. And then, right on cue, the current dean’s cat appeared in exactly the place where Alice’s cat had been close to 150 years ago. 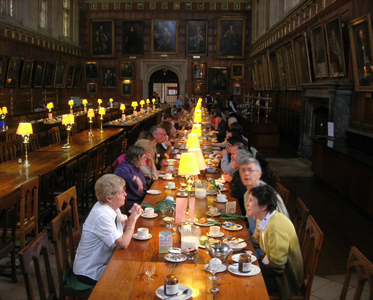 Oxford, founded in the 16th century, is full of traditions, one of which is to honor important guests by seating them at a raised table at the front of the Hall, directly beneath the portraits of Henry and Elizabeth. We were so honored (as were all of our classmates over the course of the week). This is a dress-up event. First we had sherry and then stood by our assigned seats at the High Table while the other diners were allowed to enter the Hall. Everyone else is then allowed to enter the Hall and stand behind their chairs. When all are assembled, Grace is said from the podium, in Latin! Then everyone sits and the meal can begin. Our meal was the same as at the tables below, except that we had several wines offered during the meal. The conversation, as at every table, was fresh and interesting, with intelligent people from many parts of the world, including the course director and the tutors. Oxford leavens its serious academic purpose with more than a little silliness and fun. After dinner one night, we were offered sparkling wine and the unique cavorting of the Morris Men, with their sticks and bells. Yes, that’s a Green Bay Packer’s cheesehead. The story is that the Oxford professor wearing it, although born in England, was raised in Madison, WI. After the performance, about 10 of us went down to the river to an outdoor pub … and the Morris men followed us and performed again at the pub. On May 6, 1954, Roger Bannister was the first man to break the 4 minute mile, one of the truly outstanding athletic achievements of the 20th century. He’s Sir Roger now, 80 years old, still living in Oxford where he went to school and also had a distinguished medical career. 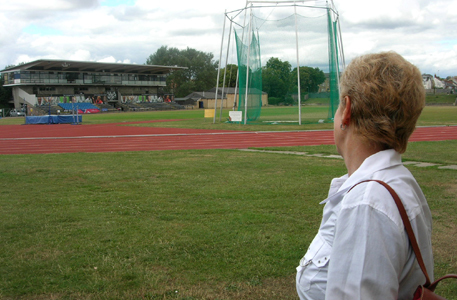 We walked to the outskirts of Oxford, through a new sports complex, and got our first view of the small stands as they were 56 years ago. It’s hard to express the thrill Pat (and me too) felt walking onto that track. It had been Pat’s intent to run one lap around the track, but she is still recovering from an injury and hasn’t run in almost 5 months, so that couldn’t be. She did, however, run her first 30 yards in months and came acoss the finish line with an enormous smile. You can see a clip of the race at http://www.youtube.com/watch?v=uz3ZLpCmKCM. I get chills each time I watch it. One night after dinner, we went to the Senior Common Room (Faculty Lounge) where tables were set with 8 glasses at each place. 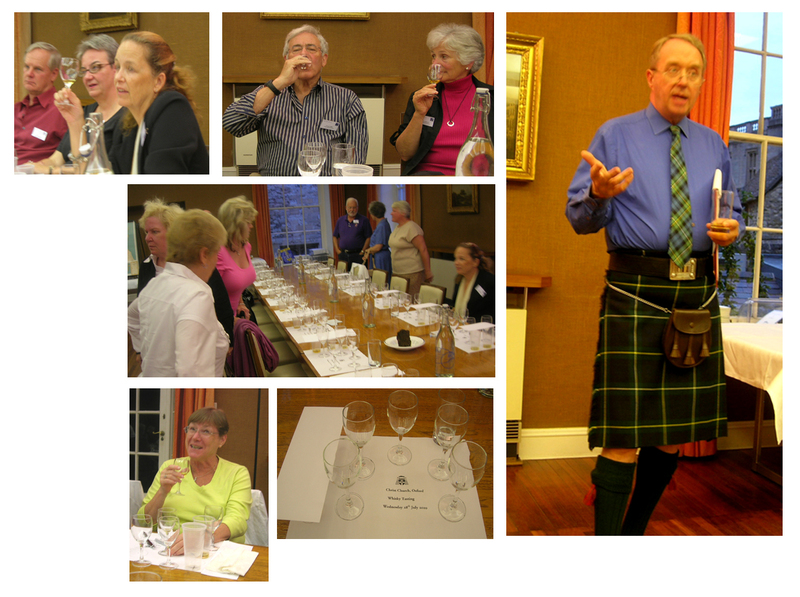 This event is held each week in the summer and hosted by John Harris, one of the top administrator of Christ Church College (did you guess he’s the one in the kilt). We each tasted 8 different whiskeys, each without diluting with water and again with a “splash” of still water, all the while listening to a talk about the production and marketing of whiskey that was informative and also quite amusing. We were so busy, what with the classes and the champagne and the whiskey, that we only went out of town once, on a bus (30 minutes) to Blenheim Palace. 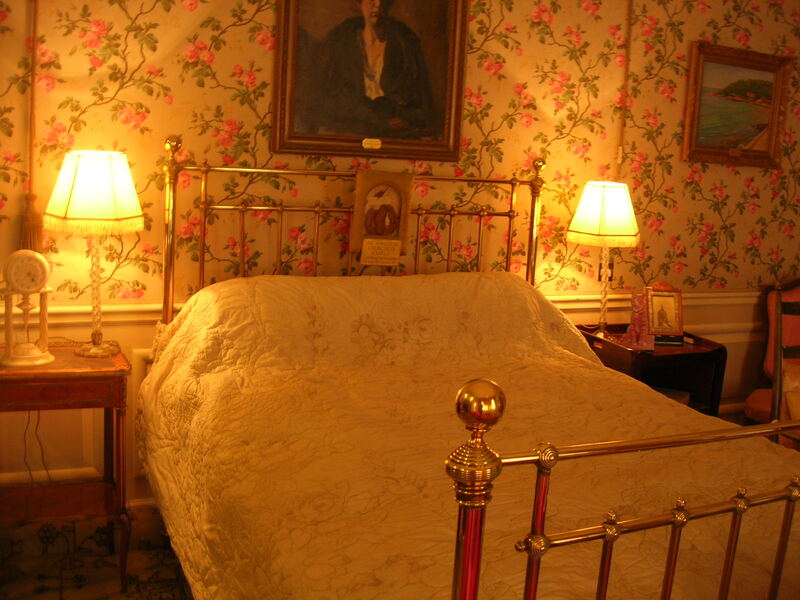 Blenheim is promoted as Winston Churchill’s birthplace, and it is, but he never lived here. His mother was visiting the Duke of Marlborough when she fell, prompting an earlier delivery than expected. I guess they stayed for a few days and then went home. 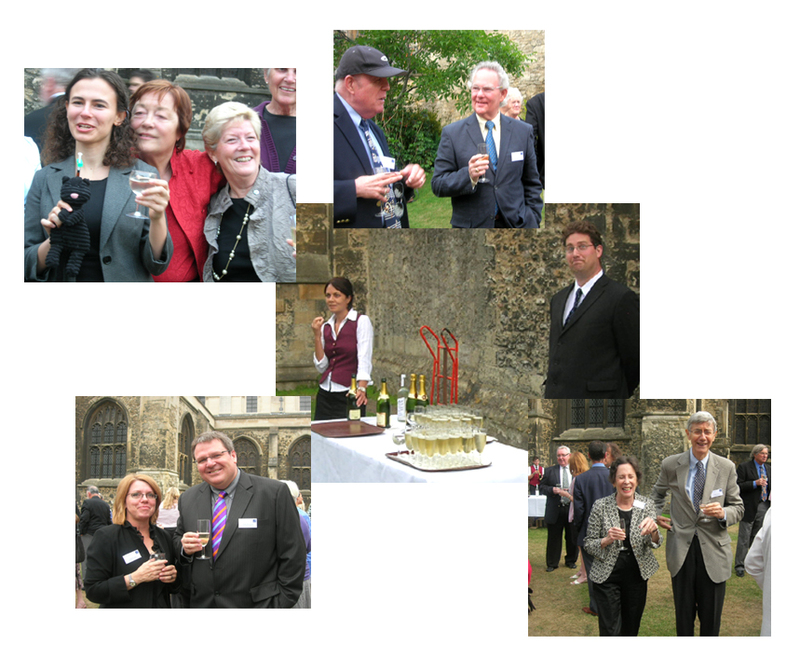 On Friday night at the end of the week, we were served champagne in the Cathedral Garden (Alice’s forbidden garden). That night at dinner, each class sat with their tutor. We received our Certificates, of which we are very proud, and then … it never wanted to end … drinks at my instructor’s room. I can’t imagine how our week could have been any better. So that was our week, in addition to each of us taking a great course and meeting many terrific people. Oh, I forgot all about the Christ Church College Picture Gallery, on the campus and home to over 300 paintings including a stunning collection of Italian Renaissance masterpieces. Then there’s the Christ Church Cathedral, the only Cathedral in England which is actually part of a college, with the only stained glass window of Thomas Beckett that Henry VIII was not able to destroy, where we attended Evensong sung by the Oxford choir. And the marvelous concert performance, piano and mezzo soprano, given at another of the Oxford colleges by my Beethoven instructor and his wife. Oh, and then there’s Blackwell’s, the most spectacular bookstore either of us have ever seen, and on this topic we’re experts. We’ll describe the courses in a separate post. Pat’s Ethics course was the talk of the week, what with their humorous discussions of euthanasia. And I had years of musical pleasure opened for me by an incredible instructor whose way with words and friendly manner was as impressive as his knowledge of the music and concert-level piano playing. But we finally had to leave, vowing as so may others do to return again. But not before one last breakfast with new friends in the old Hall. Then it’s off to London for a weekend and back to Collioure. This entry was posted on August 4, 2010 at 11:35 am	and is filed under ... 2010, ... UK - Oxford. Tagged: Alice in Wonderland, Christ Church College, in Harry Potter's Hall, Oxford, Oxford experience, Roger Bannister. You can follow any responses to this entry through the RSS 2.0 feed. You can skip to the end and leave a response. Pinging is currently not allowed. I am going to take a one week course this summer at Oxford. I really enjoyed reading about your experience. I am going alone. Were there many people there without a partner? Yes, there were quite a few singles there, and it is a great place to meet people. BTW, we will be there again Jul 22-28. Perhaps we’ll see you. Thank you for sharing your experience. I’ve been to Oxford a few times and stayed at Balliol College in 2009. This summer I plan to take a course during Week 3 and experience Christ Church as a resident. I noticed that wine, champagne, etc. seemed to be present at most evening meals/receptions. As a non-drinker, I wondered what alternatives exist. Are other beverages (tea, Coke, water…warm or not) available for dinner or will I need to make a special request? Again, thanks for sharing your thoughts and photos. Actually, with one or two exceptions, wine is not included with meals. People bring their own drinks or bottles from the adjacent Buttery bar. Many other beverages were always available. I appreciate your helpful response. 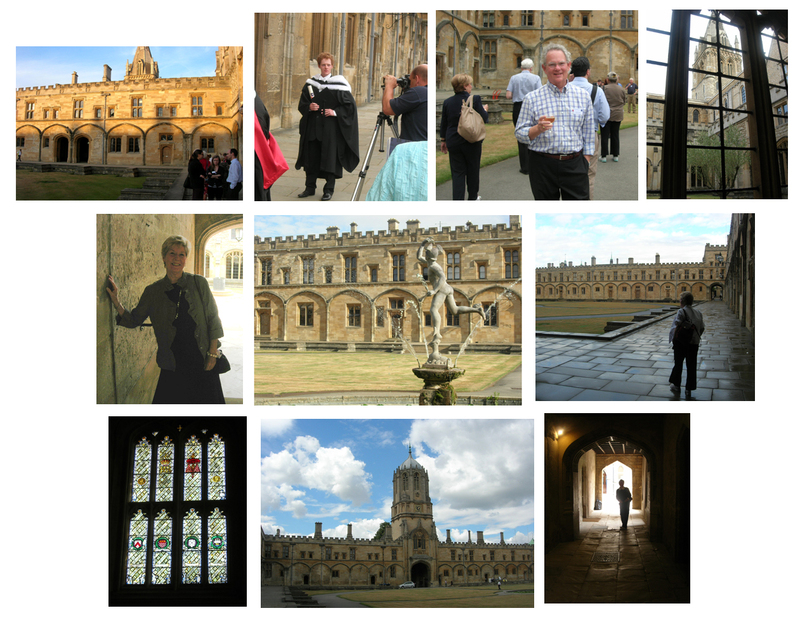 I mistakenly based my assessment on my search for online photos of the Oxford Experience. Most of those focused on the champagne reception in the garden and the final dinner in the Great Hall, perhaps bypassing the daily meals with the other beverages. I just spent some time on the web trying to find out about short courses offered at Oxford and was lucky to hit on your site. My husband has talked about going there forever, yet the closest we have been to Oxford thus far is the Peartree Roundabout on ‘our’ roundabout way to the Cotswolds. (September) This looks perfect for him (and us) and I can’t wait to see the 2011 course schedule. You truly did a wonderful job in describing your experiences. Thank you for sharing. We also just returned from Oxford after a 3 week course sponsored by UC Berkely and Oxford. 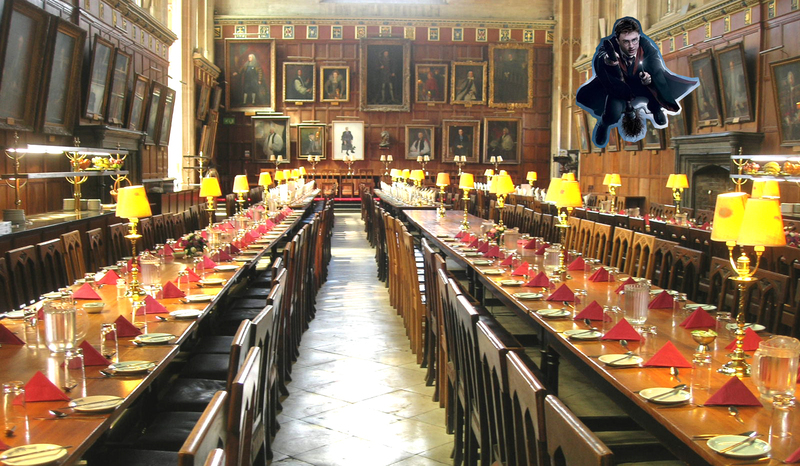 We ate and lived at Merton College. can you tell me what your accomadations were? How did you find out about your one week course? I think the first time we heard about it was a comment by Arthur Frommer, years ago. As you can surmise from our post, we recommend it very highly. At Christ College, we stayed in Meadows. We had a spacious double room (2 beds) with bathroom and shower en suite.